This is a guest post by Mia from D2. 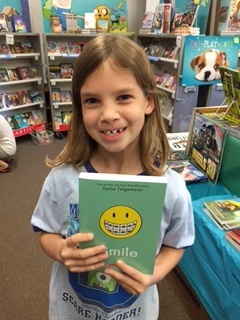 This book is called Smile. Raina is a girl she has a brother and a sister. She was playing with her friend she knocked her two front teeth out. Raina and other people can only find one tooth. She has to go to the orthodontist. She gets it replaced with fake teeth. At the end she gets real teeth. This reminds me of my big sister, Peyton, who's getting braces. Hil-AR-i-us! That's what B.J. Novak's book is. Now, B.J. Novak has a challenge for us. Send him a video of us reading the book. How can we make our video awesome? Click on "comments" and tell us your ideas! Pi Bo Id Mo = Picture Book Idea Month! Every day this month, authors and illustrators are creating 30 ideas in 30 days. Hale Kula students and teachers have ideas! Post your idea for a picture book in the padlet below. Double click on the wall, type your first name & room number. Then, tell us your idea. Who + does what + where? Or maybe just the WHO! Or maybe just the problem. Maybe the message. Click HERE to visit the padlet in a new window. Mrs. Huszar had a GREAT idea. She wanted to open the library earlier in the morning so students could "Exercise their brains" with fun activities. Tell us what you did at the Sunrise Stations! 2. Type your first name. 3. 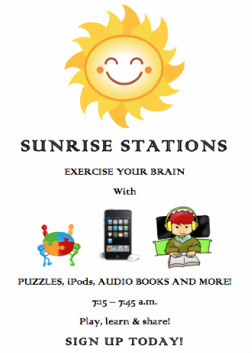 Tell us what you did at the Sunrise Station. What does the Hale Kula Library mean to you? Did you meet an author at Hale Kula? Did you do research in the library and from home using the computer? Did you post a comment on the Nene Blog and attend the discussion? The Hale Kula Library offers students, teachers and parents many opportunities to connect to information and to expand their imagination. Browse the website, look at our photos, think about what the library means to you and then enter the SLOGO Contest! Entries due February 28. Mrs. Huszar and I get many questions like this one: "Are Valentine's Day books in the V section?" Ai-chi-hua-hua! The library is organized into sections. Valentine's Day books can be found in the Easy/Enjoyable section, the fiction section and in the Non-fiction section. Hop onto Destiny and do a keyword search for Valentine's Day. Easy/Enjoyable call #s= E _ _ _(the first 3 letters of the author's last name). Fiction call #s= FIC _ _ _(the first 3 letters of the author's last name). Take a peek at the Grade 2 under instruction to learn more about the Dewey Decimal System--how the library is organized. Today we celebrate Dr. Martin Luther King's birthday and honor him for the contributions he made to our country and our lives. Visit our online resources page to find information on Dr. King--Enchanted Learning, World Book Online, and Encyclopedia Britannica have articles, videos, photos and more. You could also watch this short VoiceThread on Dr. King's childhood. Do a search on Destiny for Dr. King and for other influential people. Reading about great people teaches and inspires us. Check out the biography section of the library to learn about many, many inspirational people.